Adding a character liquid crystal display (LCD) to an FPGA project is a simple and inexpensive way to get your project talking. In this post I discuss interfacing an FPGA with garden-variety generic 1602 LCD like the one pictured nearby. These alphanumeric displays include an integrated HD44780-compatible controller with a parallel interface that enables you to send data in ASCII format one byte at a time. The output is two lines of 16 characters each on a fixed dot matrix grid. They're cheap as chips (as my English friends say) and perfect for displaying measurements, results of calculations and any other simple messages. My objective here was to develop a reusable Verilog module that could be dropped in to multiple FPGA projects and handle the low-level communication with the LCD. As part of an effort to make the Verilog as platform independent as possible, I developed and tested the module on two different boards. First is an Olimex ICE40HX8K-EVB board using the Project Icestorm workflow. (I discuss the board and Project Icestorm in an earlier post here: iCE40 and the IceStorm Open Source FPGA Workflow.) Second is an Arrow BeMicro CV board featuring an Intel/Altera 5CEFA2F23C8N Cyclone V, developed using Quartus 15.0. The Hitachi HD44780 LCD controller has been around for decades. I don't have an exact year of release, but a quick search has it turning up in catalogs and magazines by the early-to-mid-eighties. Somewhere along the line Hitachi stopped making them, but compatible replacements exist including the Sunplus SPLC780, the Samsung KS0066U and the Sitronics ST7066U. While not all small text displays are HD44780-compatible, the instruction set and interface for the controller have become something of a standard. 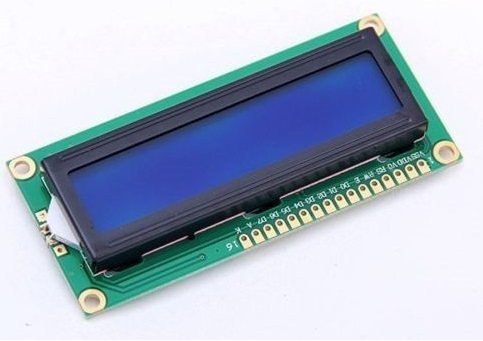 Both 5v and 3.3v displays are available. While it's technically possible to interface a 5v version, I don't have any appetite for letting 5v devices get too close to the 3.3v IO pins on my FPGA board, so I'm of course using a 3.3v version. Configuring these displays is reasonably easy and there is a lot of raw material online to help get a project started. The fact that they've been around so long means there are tutorials available for every imaginable microcontroller. They've even shown up on some Xilinx and Altera training and development boards over the years. Any trouble people have using 1602s mostly seems to stem from confusion over the controller's timing requirements - in particular the timing around executing the its moderately cumbersome initialization sequence. These timing conundra are compounded by some pretty murky writeups in the datasheets along with minor variations in the specifications. I think I've got the timing pretty-well demystified and I'll provide some detail further in this posting. But at a high level I can say that it's very helpful to remember that the timing requirements from the datasheets are minimum requirements. You don't have to try to achieve these exact time values. In fact, unless you have an application that needs to squeeze every nanosecond of performance out of the display, you can save yourself a lot of headache by building in some nice buffer around the minimum timings. 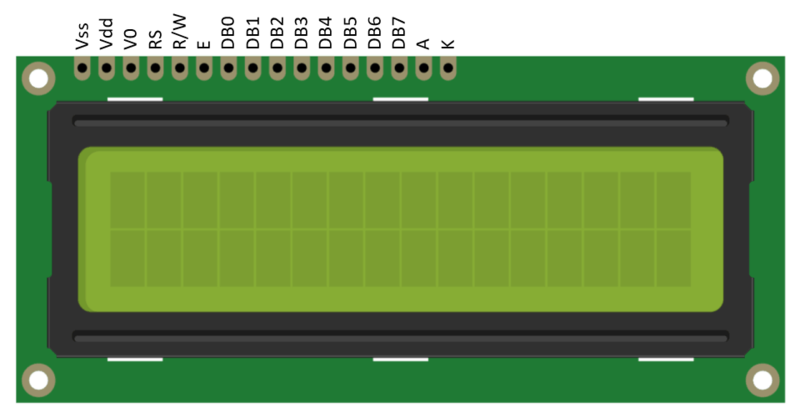 The interface to a 1602 controller consists of 16 pins as shown in the graphic below. Five of the pins are dedicated to power, including a contrast control for adjusting the backlighting. Vss (ground) and Vdd (positive supply) are the main power for the logic. A and K are positive and ground to the backlight. The V0 pin adjusts the contrast to the display. Most setups use a 10k potentiometer on the contrast pin. You can tie it straight to ground through a 1K to 4K resistor, but the contrast is pretty sensitive and if you use a potentiometer you'll probably be happier. The remaining eight pins are the data bus. As noted, data on the bus can either be a character or an instruction. Characters include standard ASCII codes for the numbers 0-9, letters a-z and A-Z, and many of the general standard ASCII punctuation and symbols such as !, ?, #, and $. Beyond those characters, the LCD will have additional characters depending on the manufacturer of the board and the version of the controller. The controller can also manage user-defined custom characters. The controller has an 8-bit mode where characters and commands are loaded one byte at a time, and a 4-bit mode where the 8-bit data is loaded in two 4-bit nibbles. The 4-bit mode saves output pins on your device at the cost of minor additional complexity sending the data. Here I'm using the full 8-bit mode. At the highest level, controlling the display can be seen as a simple process of pushing a sequence of instructions and characters through by setting up the RS pin and the DB0-7 pins one byte at a time while toggling the E pin on and off to tell the controller as each byte is ready. Set the RS and DB0-7 pins, then delay at least 40ns (nanoseconds) to let them settle. Bring the E pin high and hold it for at least 230ns. Bring the E pin low, leaving RS and DB0-7 stable for at least 10ns more. Delay an additional minimum of 40µs (microseconds) for characters or 1.64ms (milliseconds) for instructions before entering the next byte. If you study the datasheets you'll see that only RS needs to be stable before E goes high. It's therefore technically possible to bring DB0-7 up later, but it seems convenient and simplest to load the data in step one. The final delay is based on the time the controller needs to execute the character write or instruction. Not all instructions have the same duration. Instructions that clear the screen are the worst case at 1.64ms. For time-sensitive applications you can sub-divide the instructions category and push shorter duration instructions through more quickly. These timings are minimums and can vary a bit among manufacturers. I've had much better success adding some time to the first two delays. d  <= 8'h48;                      // load the databus with ASCII "H"
This simplified (but working and complete) Verilog module uses a state machine to step through the phases of loading a character, and a counter to pace the delays. One minor issue is calculating the number of clock cycles needed for the different required delays. The code sample above is calculated out for my ICE40 board which has a 100MHz clock. The formula is simple enough: clock frequency in Hertz * required delay in seconds. You just wind up with a lot of zeros on both sides of the decimal point - e.g. a 50ns delay at 100MHz = 100000000 * 0.00000005 = 5 clock cycles. With an understanding of the fundamental operation of the controller, two hurdles remain in putting together a full solution - addressing the HD44780's initialization routine and developing a concept of operations for passing data to the driver from other parts of the design. Before data or instructions can be written to the controller, an initialization sequence must be executed that configures the controller and makes sure it's ready to receive input. The HD44780 does run through a version of the initialization when it first powers up, but there are a few problems with that routine. The hardware initialization is somewhat fragile and very dependent on the circuit's power supply. It also sets the controller to a default that might not be the desired state. Best practice looks to be including initialization in the design. For my own use, I have the FPGA drive the full initialization sequence on startup and have also tied the sequence to a push button on my board for a soft reset. The sequence itself is simply a series of instructions that can be implemented using the same approach as was shown in the general case above. The only added complexity is that the timings for the delay between instructions varies, with some delays being considerably longer than others. For some reason the datasheets all seem to present this sequence as a flow chart which only serves to over-complicate the process. As with other parts of this process, I'm padding the delays here with a little more time than the datasheets present as minimum. Some of the extra time was added while I was troubleshooting and determined more time was needed for reliable performance - other places I just added time for good measure. Steps 2,3 and 4 all load the same instruction to the controller. Once RS and D[0-7] are set on the FPGA it is not necessary to keep resetting them - all that is needed is to bring the enable pin high and low at the appropriate times. Step 5 configures the LCD for the particular application - in this case 8-bit mode, 2 lines, 5x7 font. There are other options for configuration. Step 8 configures the Entry Mode which determines what the controller does as it receives new characters. The setting here fills in text from left to right while the display itself stays still. There are multiple options. To implement the initialization sequence, I again use a state machine to step through the process. I actually combine the initialization and operating phases into one 26-step state machine (code further below). Of course, my solution is only one of many possible approaches. In researching for this project and hunting up examples of FPGAs driving LCDs, I found tremendous variety in the ways that people setup their state machines and manage the timing. It's certainly worth looking around for inspiration. You'll note also that I parameterized the timing. The parameterization makes it easier to track the timings through the code. More important, the parameterization makes it effortless to use the module at different clock speeds. It is only necessary to adjust the one value for clock speed and all subsequent delays adjust accordingly. The final steps in making a usable LCD driver involve reconfiguring the module to process incoming data (rather than just displaying the letter "H" in the notional code) and establishing some type of handshaking. Adding input to the basic notional module for data is trivial. I chose to treat it as one 9-bit chunk of data that includes both the RS and DB0-7 bits, but they could just as easily be conceptualized as two separate inputs. Slightly trickier is the idea of establishing communication between the LCD driver module and the hypothetical other module producing the data. The LCD driver needs to know when there is fresh data available to be written to the display. Likewise, since the LCD driver needs considerable time to process a byte of data, the data producing module needs to know when the LCD driver is ready. In the code below you'll see that I addressed these two parallel needs with a "data_ready" input bit and a "busy_flag" output bit. In states 23-25, which comprise the portion of the state machine that actually writes data to the LCD, state 23 will idle until the data_ready bit goes high. Once the bit goes high, the module sets its own internal tracking bit called "start" to high, sets the busy_flag output high, and starts processing the incoming data. The busy_flag and start bits remain high until the process is complete. Another subtlety of the updated state machine is that state 25 now checks the ninth bit (RS) to distinguish between character and instruction input. When the RS indicates an instruction, the delay is longer. Below is the Verilog code for the full LCD driver module. This module has been tested with a hello world demonstration. I'm not displaying the full demo, but you can download it here: Verilog LCD Hello World Demonstration. The demonstration adds a ROM with the ASCII codes for Hello World and a controller that interfaces with the LCD module to feed one character at a time. // End Initialization - Start entering data.